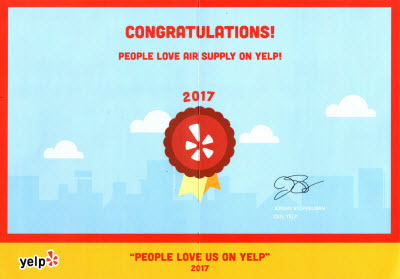 Air Supply Heating and Air Conditioning of Las Vegas, Nevada is dedicated to our valued commercial and residential customers locally and in surrounding areas. Being fully licensed, certified, and insured we not only provide our professional expertise and services in the HVAC industry, but we do so with surpassing quality, traditional values, high morals, and family-friendly customer service. 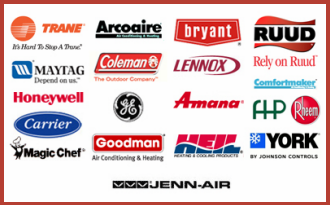 Air Supply Heating and Air Conditioning utilizes state-of-the-art equipment, materials, and products exclusive to licensed professionals to ensure our customers receive nothing less than premium results. Our technicians are recruited for their advanced training background, experience in the field, and remarkable skills that make them among the elite to ensure all the work Air Supply Heating and Air Conditioning performs is done right the first time. 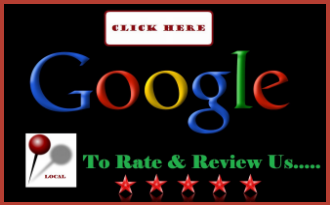 Air Supply Heating and Air Conditioning takes care of the air conditioner’s fan in your home or business throughout the Las Vegas, Nevada Valley. The central air conditioner utilizes 2 fans, one in the outside unit that blows over condenser coils, which releases heat from your home and the other is found inside that blows cool air for your home. Both of the fans are fairly durable but like with most moving parts, they are equally susceptible to wear and tear and periodically need repair. Air Supply Heating and Air Conditioning can assess the problem and make the necessary repairs to get your air conditioner’s fan operating and full efficiency. 1) Blocked air filter. You may find your indoor fan not working adequately in the event that your air filter is severely clogged, because the air that the fan blows is completely blocked. Check your air filter and replace or clean it if it is compacted with debris if you hear the fan operating but are unable to feel a difference. 2) Burnt out motor. As previously mentioned, moving parts wear down over time; the motor to the fan is no exception. Over time and too much stress, the motor can burn out; especially so if regular maintenance has been neglected. Depending on the age and condition of your system, a poorly operating fan motor is a serious issue that requires professional repairs or possible replacement. 3) Capacitor problems. Energy that is used to power up to your air conditioner’s fans is produced by the capacitor, which stores up the energy. The capacitor can become faulty and/or stop working, which results in one of the fans to stop spinning. A replacement is typically required. 4) Contactor issues. The contactor is a switch that enables electricity to flow in and out; controlling the compressor as well as the condenser fan motor. Contactor frequently deteriorates over time, restricting the outside fan performance. 5) Loose or broken belt. Belt-powered fans found in older systems can experience loosening or breakage; causing the fan to longer function. Though this may be repairable, it is often an indication that it’s time for a new air conditioner. 6) Unit not receiving power. Fan problems might not be the fault of the fan’s assembly, but instead the fan is not powered up. Parts of your air conditioner can overheat; tripping your circuit breaker, which then shuts down the air conditioner. Flip the switch at your circuit breaker back on to regain power, but eventually a professional should inspect the unit. Many air conditioning fan issues can be easily avoided with routine maintenance, tune-ups, and inspections by Air Supply Heating and Air Conditioning. With these services, we are able to catch the beginning stages of fan problems. 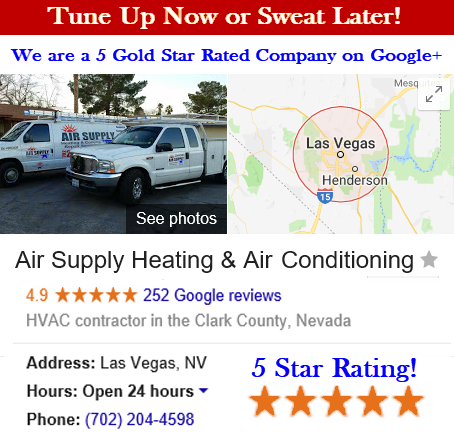 If your Greater Las Vegas, NV commercial or residential air conditioning fans are giving you problems, contact Air Supply Heating and Air Conditioning and let our experts help you!